cap is up to 20 cm broad, smooth, dry, white to cream. cap is convex when young, then flattens in maturity. flesh is firm and white to cream. gills are crowded, free from the stem, progressing from pink-tinged white to dark brown/black in age. stem is smooth, white, unchanging in color when bruised. Base of the stem does not stain yellow when cut or bruised. in young specimens, the underside of the partial veil exhibits a characteristic cogwheel-like pattern. in older specimens, the double veil progresses to a skirt-like ring around the stem. grows in grassy areas, meadows and fields. appears in late summer or fall. taste is mild, with a light licorice/anise odor; cook before eating. 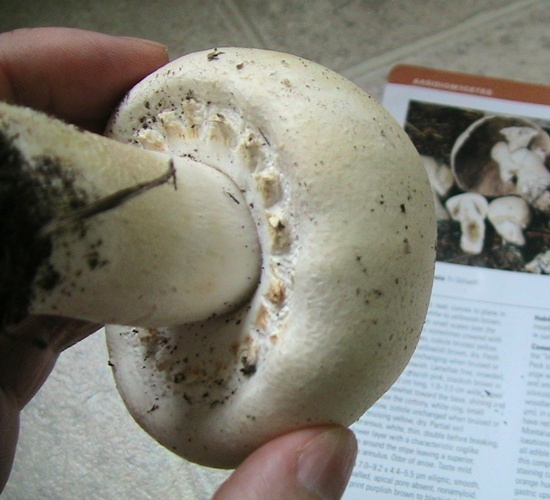 warning: do not confuse with the poisonous Agaricus xanthodermis, which is similar in appearance but has a stem that buises yellow at the base when cut or bruised. warning: only collect younger specimens that still have the characteristic cogwheel pattern on the unbroken veil; older specimens could be confused with poisonous look-alikes.